It seems like you can find decorating ideas everywhere these days: Pinterest, Instagram, on Facebook and in magazines. What you don’t always get from these wonderful images are the back story– the author’s voice and word… which give context to the images and connects you to the author and their work. I may be an old fashioned girl but I still savor the look and feel of books. REAL books, with pages, stunning photos and most significantly, a feel for the person (or people) behind the concepts. What circumstances or decorating dilemmas sparked this amazing solution? What was their budget and how did they use creativity to get the “look” for less? And the big picture stuff: What are their thoughts, tips and strategies when it comes to sprucing up their homes? 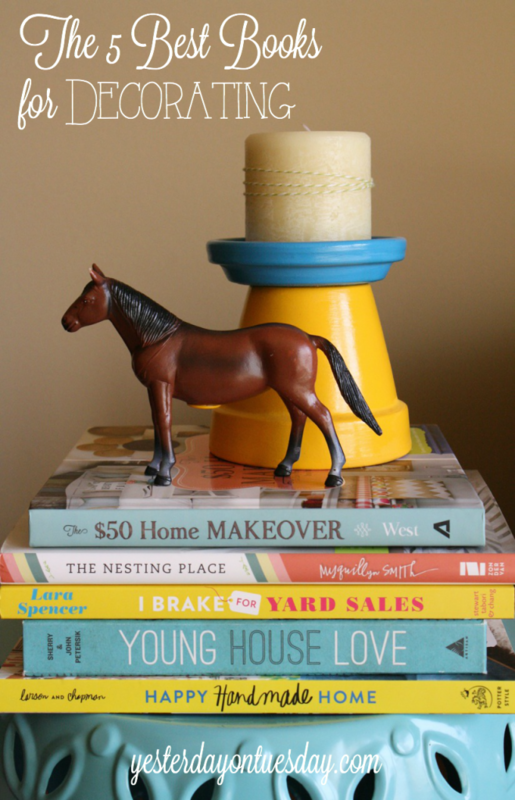 Here are my picks for the five best books on decorating. I felt connected to each of these books and their authors for different reasons. These are the works I page though over and over and feel inspired by every time! Here they are in alphabetical order (I love them all equally)! Before the book and the blog (A Beautiful Mess) there was a line of charming scrapbook paper and products called “Love, Elsie.” Elsie’s designs were fun, playful, bold and fresh. I fell in love with her style right then and years later she’s expanded her repertoire to include all sorts of DIY and decorating projects. She and her sister Emma have a complementary design aesthetic and they’re sharing it in “A Beautiful Mess Happy Handmade Home.” Creative. Spunky. Innovative. The preppy/peppy host of Good Morning America has style to spare! I love Lara’s style– both her decorating style AND her writing style. This girl loves a good antique store/flea market/garage sale, and the shares her tips on scoring great pieces in this book. Her ideas are impactful with a sense of whimsy. She takes plain jane furniture and makes them look like statement pieces. Lara is a pretty much a pro decorator in her own right, but she doesn’t take herself too seriously. A fun and informative read. Preppy. Peppy. Well-written fun. You’ll find oh-so-many wonderful ideas in this book. It’s packed with tutorials on creating some popular DIY/decorating projects– many of which you’ve probably seen in magazines or on Pinterest (they may have started with this book). One really nice touch is that author Shaunna West lists the cost, difficulty, time and materials list for each project, making it easy peasy. I find myself reading and rereading “The $50 Home Makeover” and discovering new gems (and DIY techniques) each and every time. Organized. Accessible. Lovely. Like sitting down to a cup of coffee with your best friend, The Nesting Place is full of comfort and somehow leaves you with a feeling of peace and calm. This book’s author has one of those “backstories” that I really enjoyed reaching about. Myquillyn Smith shares her personal decorating journey through moving and decorating thirteen homes of varying sizes, styles and prices. Smith takes you along through the many moves, making mistakes, learning lessons and moving on. She also helps you make intentional spaces and let go of the need to be perfect. Plus the photos are amazing! Comforting. Inspiring. Genuine. The couple behind Young House Love (the blog and the book) are possibly the most adorable decorating duo EVAH! Their tone is friendly and approachable and they do a great job of explaining things in a way anyone can understand. There are a whopping 243 ideas (at least) in this book, with varying degrees of difficulty (buy they make even the tougher stuff seem doable). I appreciate that they share basic things like de-cluttering a bookcase, right along with more challenging tasks like replacing your bathroom faucet! Modern. Warm. Accessible. I’m an Amazon affilate, links are affiliate links. Just reading about “doing something” makes me feel as if i have achieved something…Great post thanks for sharing. This is a wonderful list. Thank you!